Government officials confirmed that the agreements under which Ontario and British Columbia will harmonize their retail sales tax with the federal goods and services tax call on Ottawa to bring forward HST legislation by March 31, 2010. It seems obvious the Bloc would vote against this. The NDP would have a hard time supporting this but, you never know, maybe Jack will meet an unemployed single mother in Sudbury who pleads with him to vote for it, prompting a change of heart. Because, gosh darn it, he's thinking about the people! But, failling that, the fate of the HST legislation would lay squarely in the hands of the Liberals. Which would be, to put it bluntly, rather awkward. Having already split the party in Quebec, going to the wall against the HST would risk alienating many provincial Liberals in Ontario and British Columbia. 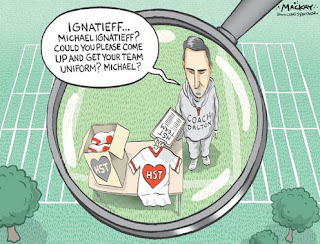 Which explains the rather...I guess the polite word would be "nuanced" position, that Michael Ignatieff has taken on the HST. 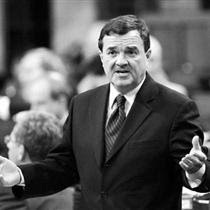 In short: he's against it, it's a bad idea, but he'll honour the deal between Flaherty and the provinces. So, given that, how do you vote against a piece of legislation you've promised to honour? Then again, how do you vote confidence in a government you've explicitly said you don't have confidence in? Presumably the Liberals will need to find an answer to one of those questions, unless Flaherty rolls the HST up into his next budget. It's also a dicey situation for the Tories who probably don't love the idea of framing the election around their support for what is widely perceived to be a tax increase. After all, that makes it a lot harder for them to go on about Michael Ignatieff's secret plan to raise taxes. A new NDP ad is out (which I assume won't actually air), where Jack chides the other parties...for doing what he proudly did for the past three years. When it comes to connecting with Quebecers, Ignatieff is surrounded by bright, well-meaning advisers who – like their leader – don't even know what they don't know. Unless that intellectual vacuum is addressed, the Liberal machine in Quebec will continue to rattle on empty. "The problem for a leader who has never been in the trenches, he doesn't know what loyalty is all about." MONTREAL - Liberal stalwart Denis Coderre has resigned as the party's Quebec lieutenant and defence critic. He says he will remain a member of Parliament but no longer believes he has the confidence of his leader, Michael Ignatieff. Coderre has expressed support for the leader, but fired a shot in Ignatieff's direction at a news conference in Montreal this morning. He says events of recent days send a message that the Liberal Party of Canada is run by Toronto advisers - not by party members close to the grassroots. Also, be sure to check out Wells and Delacourt. 1. Paul Wells described Question Period (the House of Commons one, not the CTV one) as "the malignant growth on our democracy" or something of the sort. And it does seem that QP is one of the most obvious examples of the problems in our system. So, on that count, I completely like Wells' suggestion of extending question and answer time to 45 seconds (why not a minute? ), and only requiring the PM to be there one day a week. 2. It was pointed out that the only time our leaders have gone on TV in the past decade has been to explain why they should be allowed to keep governing. I like the idea of taking a page from the US and having the Prime Minister go on prime time more often to discuss the issues of the day. I know, I know, whenever you say "taking a page from the US", it means the idea won't go anywhere in Canada. And some people will be annoyed that it might bump "Dancing with the Stars" every now and then. But if Canadians saw our leaders talking about serious issues every now and then, maybe they'd be inclined to take them a bit more seriously. 3. Although those ideas are great, Wells did toss out one lead balloon - having caucus pick their leader and review their leadership. Eddie Goldenberg quite rightly pointed out that maybe having the Liberal leader always picked by Ontario MPs isn't the best thing for a national party, and I shudder to think of the behind the scenes horse trading that would go on for support. But, most of all, if you want to engage Canadians in the democratic process, you need to give them more of a say, not less of one. And giving average Canadians the right to buy a membership and vote for party leaders is a way to get them engaged in the democratic process...I really fail to see the benefit of taking that away from them. 4. John Ralston Saul tended to meander off into irrelevant rambling at least 80% of the time. But he did bring up two very valid points. First, that the problem with our debate is one of content, not tone. If politicians debated ideas, there'd be nothing wrong with raucus debate. Secondly, that young people are active in a wide range of organizations - but they need to actually join political parties and run for office so as to change our political system from within. 5. There was general consensus the media has done a bad job covering politics over the past few years...even by the media on the stage. 6. There is no problem too big or too small that Ed Broadbent doesn't believe can be solved by either tax increases or proportional representation. I'm not dead-set against PR, but I do take issue with Ed chastising Liberals and Conservatives for not leading the charge for PR. The fact is, two Liberal Premiers held referendums on the topic and let the people decide. Broadbent feels they didn't push harder because the current system benefits them. Which is true. But you also have to acknowledge that one of the reasons NDP and Green supporters are so keen on PR is that it's a system that would hugely benefit their parties. So everyone is thinking a little bit about their own best interests and I think McGuinty and Campbell deserve credit for facilitating the debate on a topic that could ultimately hurt them. I like following leadership races, maybe even more than general elections. The candidates are less well know, the dynamics are more intriguing, and the results are less predictable. It's great when the winner of the race has a legitimate shot at one day forming government, but there's also something to be said for the characters you get when looking at fringe party races. Luckily, there's a race in Alberta with both of elements in it. On October 17th, the Wildrose Alliance will be picking a new leader. As I said last week, these guys need to be taken seriously. Especially given the rumours up to 10 Tory MLAs are considering crossing the floor (re-tweeted by Danielle Smith, so she's not trying to downplay them). That's right, MLAs are considering leaving a party with 70 seats who have been in power for 40 years, for a party with 1 single MLA. What can I say, Alberta politics has always been a little weird. My objective in running for the leadership of the party is of course to promote better government provincially, but it's more than that. It's also to promote a better federal outcome by keeping the Liberals out of office - and it can be done. I'm not a separatist, but like most Albertans I am anti-liberal, and frankly I believe we should go to the polls to reconsider our options in Confederation - each and every time a Liberal government is elected or reelected in Ottawa. We can't tell people how to vote, but if the east insists on having a Liberal government they need to know they might have it all to themselves at the end of the day. Again, my objective is not to break up Canada - it's limited government - which is impossible under a Liberal government. When I sign my book, excerpted at www.fixcanada.ca and of which I have sold almost 20,000 copies in this province, my normal salutation is "Toward a better, liberal-free Canada!" I include this about Willerton, only to emphasize the self-evident problem the Wildrose Alliance Party is going to face. Maybe it's not self-evident to a 12 year old or to readers of Fix Canada, but I think most people here will be able to figure out what that problem is. Moving on, Willerton has thrown his considerable influence behind Mark Dyrholm. If you visit Mark's website and manage the dodge the exploding pop-up ads showing his support for Paul Hinman (for the by election which was held two weeks ago), you'll see that he starts his bio off by declaring "Mark has a solid education". Mark also has solid policies, although I could see a few of them being problematic in practice, notably his pledge to call an election if his government doesn't bring forward a balanced budget, and a promise to have all major expenditures approved by referendum. Smith has picked up a slew of endorsements, including one from Ralph Klein's father, who she seems to have a bit of an unhealthy obsession with - up until today, the top two stories on her website over the past week and a half have dealt with Ralph's dad dumping on Stelmach. Browsing through her policies, she's proposing to hold a referendum on whether or not to hold referendums. And although many of her ideas are decidedly libertarian and right wing, she's not afraid to say words like "environmental safeguards" or "alternative energy". And that's the genius of Smith's candidacy - she doesn't come across looking or sounding like a scary right winger, leading many moderate conservatives to become quite fascinated with her candidacy. And even if her party isn't even remotely ready to govern, at least she sounds like someone capable of leading Alberta in the 21st Century...more so than the man currently doing just that anyways. 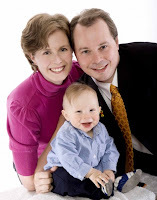 David Miller won't for re-election next year. Presumably, the early line would have John Tory, George Smitherman, and Karen Stintz as the favourites. Well that wasn't so hard, was it? An open nomination in Outremont, involving the guy who held the riding for over a decade. 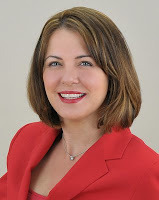 Ignatieff's star candidate gets the much more winnable Jeanne-Le Ber riding, where the local riding association (presumably) won't resent her appointment. A Liberal MP says the latest taxpayer-funded mail-out to his district promoting federal Conservative policies has gone totally off track. Avalon MP Scott Andrews says the Conservatives sent a so-called "10-per- center" to his riding promoting the Harper government's work to improve Canadian rail service. There has been no railway in Newfoundland since the 1980s. If we can sell out both of our Leader's Dinners in Edmonton and Calgary this fall, our debt will be completely paid off. If you'd like to help, please visit our website at www.albertaliberal.com to purchase your ticket now. If you can't make it to the dinner yourself, you can donate your ticket to another keen Liberal who perhaps cannot afford a ticket themselves. The ALP has been massively in debt ever since I was a member - if they can get in the black this year and start building up an election war chest, this is outstanding news. 3. The nominated Conservative candidate in Markham says the Tories aren't spending stimulus money in his city because the voters had the gall to elect a Liberal MP last year. Stupid voters. For example, Kennedy said, in British Columbia, Conservative ridings had been allocated 13 times as much money as opposition ridings. In Quebec, 2.7 times as much money went to Tory ridings, he claimed. In Ontario, Conservative ridings got 11 per cent more than opposition ridings, he said. He said 14 of the 16 announcements the prime minister has made were about infrastructure projects previously planned or won’t be built for years. What I really like about this is that the opposition took the time to do their homework, rather than just shouting banal insults in the House of Commons. There's an argument to be made that some of this is because the Tory ridings are more rural, but there's sure a lot of smoke coming out of this one. 5. Kudos to young Liberals Jonathan Pedneault and John Lennard for having the guts to call out the party on their handling of the Outremont non-nomination. Apparently, Cauchon has been offered Jeanne-Le-Ber to run in. I'd rather see Cauchon in Outremont (where he has roots, making him a good bet to knock off Mulcair) and the star in Jeanne-Le-Ber...but who am I to question Denis Coderre's political judgement? 6. In less controversial nomination news, Stan Kutcher is the Liberal candidate in Halifax. HALIFAX: Maritime lobster fishermen in need of financial help are getting a lift of another kind. The hotline is supposed to offer details about a short-term assistance program. Officials with the federal Fisheries Department couldn't immediately be reached for comment. The department's four other numbers for the Gulf region, Newfoundland and Quebec are working properly. Since everyone has been clamouring for Ignatieff to let Canadians know a bit more about his vision for the country, it's great to see him giving speeches like this. • Improve upon Canada’s 13 out of 30 ranking in research and development by driving strategic investment to job-creating innovation throughout the economy, including clean energy, high-tech, advanced manufacturing, health sciences, forestry and farming. Yeah, some of the advice is more constructive than others, but they all make for interesting reads. Man, this fall election is more "on again / off again" than Ross and Rachel. When we last left you, the election had been delayed, thanks to the NDP's courageous/cowardly decision to "get results for people"/"roll over". So, that was that, we could all sit back and focus on the new season of Survivor, and leave the drama behind. Or so we thought. Dun dun dun! At this point, things get a bit murky - the NDP want to amend the legislation, an ideas the Tories are cool to. Presumably the NDP are going to filibuster the stuffin' out of this legislation to avoid it passing, but it's unclear how long they can stall for. 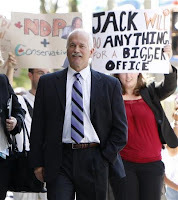 Jack has also suggested the somewhat comical notion that the NDP might keep parliament alive in the hope of getting private members bills through - that's a pretty small fig leaf that everyone in Ottawa will see through right away, but if he needs an excuse, that might be it. Ho hum. Toss in the low voter turn-out (I'd project it out to be about 33% when all the votes are counted) and the fact that the Liberals didn't have to face a Wild Rose Alliance candidate, and this looks like just a run of the mill Liberal hold. 6. Did I mention HST? And, yeah, the former Liberal MPP is facing manslaughter charges. So this could have been a disaster for McGuinty. Instead, he gets a convincing win, which should stem any momentum Tim Hudak may have been building, and earn McGuinty a far more favourable narrative than he would have gotten had St. Paul's fallen. Oh, and lost in all the above analysis is the fact that a great humanitarian, Dr. Eric Hoskins, is now an MPP. This is a guy who has given his life to helping heal children in war zones around the world. I was door knocking tonight with a University friend of Eric's who first met him in Ethiopia, and he couldn't stop saying great things to say about Eric. Quite simply, this man is in politics for all the right reasons, and we need more people like Eric Hoskins involved in the political process. So maybe it's best to look past the spin and just focus in on that. And now we have a Conservative-socialist coalition, propped up by the separatists, passing that very same budget Jack was talking about above. And after being almost certain that we were heading into an election a week or two ago, there's now no election until EI gets through the House - which I imagine won't be overly fast, given it's now in a lot of people's best interests to have it not move fast. So here's a handy guide to help you navigate through the topsy turvy world of where the parties stand on the need for an election. I may have to update this guide on a weekly basis. Last year: Nothing wrong with early elections. This spring: No one wants an early election. Now: No one wants an early election. In reality: Given their complete unwillingness to compromise at a time when the NDP is bending over backwards to find any excuse imaginable to support the government, it's a safe bet that Harper wouldn't mind a fall trip to the polls. Last year: Backing down and loving it! This spring: Backing down, but putting the government on double secret probation. Now: Trying to force an election at every opportunity. In reality: Glad the NDP are rolling over. Last year: Voting against the Conservatives. Accusing the Liberals of being wimps. This spring: Voting against the Conservatives. Accusing the Liberals of being wimps. Now: Errr...let's make parliament work guys. In reality: Really don't want an election. Rahim Jaffer, husband of Simcoe-Grey MP Helena Guergis, has been charged with drunk driving and possession of cocaine. Police stopped Jaffer, a 37-year-old Angus resident, on Sept. 11 on Regional Road 50 in Palgrave. Caledon OPP say he was speeding through the village. Jaffer will be in Orangeville criminal court on Oct. 19 to answer the charges. His license was suspended for 90 days. 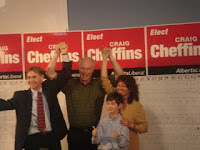 Jaffer was elected MP for the Edmonton-Strathcona riding in 1997, a seat he held up until last year's federal election, when he lost to the NDP candidate. "Jack Layton and the Ottawa NDP have publicly supported the legalization of marijuana. In fact when asked about marijuana Jack Layton called it a wonderful substance which Canadians should be free to smoke at home or in a cafe. Edmontonians understand how difficult it is to make sure our children make the right choices especially on serious issues like drug use. The Conservative Party supports drug free schools and getting tough with drug dealers who sell illegal drugs to children. Don't let our schools go up in smoke..on October 14th vote Conservative. Authorized by the official agent for Rahim Jaffer." The NDP say they will vote to prop up the Conservative government this week and for some time – probably through the fall – if the Harper government follows through on promises to expand employment-insurance benefits. The New Democrats deputy leader, Thomas Mulcair, expressed his party's inclination to keep Stephen Harper's government alive until the employment-insurance money flows. Speaking to reporters after a Wednesday morning caucus meeting, Mr. Mulcair, said his party wants to back an EI expansion promised by Human Resources Minister Diane Finley – as long as the $1-billion in extra funding is really there when the details come out. Prime Minister Stephen Harper vowed there would be no backroom deals with the NDP, but it appears the edict even extends to emails. The Globe and Mail has learned that the Prime Minister's chief of staff, Guy Giorno, has yet to return an email sent to him several days ago by his NDP counterpart. ""I've been a strong Conservative all my life like any normal Albertan," voter Ellie Lucille Scott told CBC News. "But I think that people do need to be put on their toes a little bit and I think that's the message I would like to see them get at this time." You may have already seen this one around, but Environmental Defence has released a "Just Visiting" spoof, in honour of Harper's Obama photo-op tomorrow. I'm not sure I necessarily understand twitter or what purpose it actually serves, but the fear of being labelled a Luddite by the blogging community is just too strong, so I caved. Yeah, yeah, by-elections are meaningless. The Alberta PCs lost the Elbow by election in 2007 and a year later, they swept the province, winning 70 seats. This isn't just PCs staying home (although that's definitely happening). The Wild Rose Alliance, a leaderless party, has already more than tripled their 2008 vote total. That's something the PCs should be very, very concerned about. UPDATE: With the advance polls still to come, Hinman is up by 275 votes on the Liberals and 1,124 on the PCs. Assuming his lead holds (I have no idea how much of a push the parties made to get people out for the advance vote), Hinman would have the only 2 wins in WRA (and their previous incarnations) history - in two different ridings, hundreds of miles apart. That's no small feat. "I just believe the math. The math is such that it is extremely difficult for any political party to win a majority," said Harper, who later chiding Dion for predicting that the Liberals could win a majority. In a closed meeting, held last week in Sault Ste. Marie, Prime Minister Stephen Harper told a group of Conservative supporters that he needs a majority mandate so the Conservatives can proceed with their plan to dismantle gun control. 1. The pace of candidate nominations has picked up, but the parties still have a long way to go, if you assume an early October writ drop. The Tories have nominated 175 candidates, the Liberals 77, the Greens 33, the Bloc 21, and the NDP 16. Thia may, in part, explain why the NDP are cool to the idea of a fall election. 2. There's some interesting analysis on political donations here. The short of it is this: even though the Liberals have made monumental leaps and bounds forward with fundraising - to the point where they're only 1.6 million behind the Tories so far this year - they've maxed out a lot more donors than the Conservatives have. "The budget is not good for Canada, it's not good for Canadian families"
So, because a budget vote is a confidence vote, on behalf of the tens of thousands who are going to be thrown out of work but will not get any help from this government or this budget, on behalf of the people who have waited too long for child care or health care, on behalf of the seniors who have lived too long in poverty, and on behalf of future generations who are counting on us to take strong, urgent and bold action on the environment, we will vote no confidence in this government. Our former leader and respected member of this House, Tommy Douglas, once said, “Courage my friends, 'tis not too late to build a better world”. I am disappointed that others in this House are not willing to show that same courage and that same conviction at this important moment in time. Meaningless amendments will not change the fundamental failures of this budget or repair the trust that this government has broken with the Canadian people. We cannot support such a budget or such a government. My, how times have changed. What would Tommy Douglas think Jack? Let's face it - no one's paying attention to politics over the summer, save perhaps political blog geeks like myself. So I took a break from the monthly poll soup updates. Liberal Leader Michael Ignatieff vowed Friday that his party would never enter into a governing coalition and said he could make Parliament work without such a deal. "In January, we did not support a coalition, and we do not support a coalition today or tomorrow," Ignatieff told reporters in Ottawa. So I guess we can put this whole thing to bed, right? Right? You know, I'm starting to think Harper may have played his cards a little early in this one. There's only so many ways to write "Harper raises coalition ghost, Ignatieff denies it" before the story starts to get a bit stale. As much as I love leadership races, and as interesting as it is to watch a race where the winner actually becomes Premier, I don't plan to follow the Manitoba NDP leadership race to replace Gary Doer that closely. As in, this will probably be the last post on it until so-and-so wins. Conservatives themselves doubt Harper's judgement. How can we trust him? MONTREAL — There's a surprising new star making a cameo appearance in Conservative ads attacking Liberal Leader Michael Ignatieff: his name is Justin Trudeau. French-language TV ads that have begun airing in Quebec show the rookie MP blasting a few volleys of friendly fire at his leader. The ads include clips from an interview Trudeau did during the 2006 Liberal leadership race. "Ignatieff, he's a little all over the place sometimes," Trudeau says in the spot, in a clip drawn from a 2006 TV interview. "He says this, he says that - he contradicts himself." Trudeau then delivers this little parting shot: "For me, he's not someone with... maybe he has the intelligence, but maybe not the wisdom required." The ad's narrator ends the spot by asking viewers: "Liberals themselves doubt (Ignatieff's) judgment. How can we trust him?" So, some guy who wasn't an MP and supported another guy in a leadership race Ignatieff lost - three years ago - had some tame criticism of the front-runner. Well, colour me shocked. If you're that desperate Tory war room, I hear Bob Rae used to berate Iggy when they were college roommates for not taking out the trash. OTTAWA (CP) - Tony Clement painted Stephen Harper as a divisive, unelectable Conservative leader Wednesday in a televised debate notable for the absence of high-profile candidate Belinda Stronach. Clement, the former Ontario health minister and acknowledged underdog in the three-way race, was clearly on the offensive against Harper. He suggested the former Canadian Alliance leader will be unable to unify Conservatives and draw Canadians outside the party to its fold. "Stephen . . . you've been on the record as a wall-builder. I want to be on the record as a bridge-builder." Clement then accused the Calgary-based MP of proposing to build a firewall around Alberta, of writing off electoral prospects in Quebec and of badmouthing Atlantic Canadians. With an election call likely under a month away, we're starting to get an idea of the narratives the parties will be using to try and frame the campaign. After all, elections are all about the 10 second story, be it "throw the crooks out", "it's the economy stupid", "we need free trade", or "hope". A clear, easy to understand narrative that resonates with voters - like the ones above - can win you an election. A muddled, confusing narrative won't win over a single undecided voter. We can choose a small Canada—a diminished, mean, and petty country. A Canada that lets down its citizens at home and fails them abroad. A Canada that’s absent on the world stage. Or we can choose a big Canada. A Canada that is generous and open. A Canada that inspires. That leads the world by example. That makes us all proud. 2017 will be our 150th birthday. We can be the smartest, healthiest, greenest, most open-minded country there is—but only if we choose to be. We can build a Knowledge Society, from pre-school to post-secondary, with quality early learning and childcare for every Canadian child. We can ensure that every Aboriginal Canadian gets a world-class, not a second-class education—with the opportunities to match. We can create tomorrows' jobs by investing more, not less, in research and innovation. We can invest in our environment—and invent the clean energy technologies that will have the world beat a path to our door. For the Dippers? Well, they've been fairly consistent with their "only we can oppose Stephen Harper" line, but they seem to be backing down from that. So, as is the case with finding money and finding candidates, we'll consider the narrative search a work in progress for them. Conservative strategists want to remind their base, and swing voters, of the alliance the Liberals forged with the NDP and Bloc – and frighten them with the notion Liberal Leader Michael Ignatieff might try it again. The accusation plays right into existing Tory attacks that paint the recently installed Liberal chief as a political carpetbagger who's returned to Canada after a long absence merely to win power. “They can tie the two together and say ... ‘He will force an election even when there is no reason for it and there is no policy distance between the two parties on any major issues. And he's forced an election which will lead to him rebuilding the deal with the other two parties,' ” said University of Calgary political scientist Tom Flanagan, a former Harper adviser. The anti-coalition campaign strategy is also an argument in favour of a Tory majority because it paints this outcome as the only way to avoid the risk of another alliance between the Liberals, NDP and separatist Bloc Québécois. Well, I would argue that a Liberal majority is another way to avoid a coalition but, regardless, this seems to be the message the Tories intend to put out there. Given the visceral backlash we saw to the coalition, it's actually not a bad narrative to run on strategically - especially when you're a government with no real accomplishments or vision. Like Flannagan says, the success of this strategy really lies in how plausible this is to Canadians. Personally, I can't imagine Ignatieff touching it again, given how radioactive it was - I would hope voters are able to draw the same conclusion. QUEBEC — Gilles Duceppe on Tuesday defended plans by organizers to read aloud the 1970 Front de Liberation du Quebec manifesto during a festival this weekend on the Plains of Abraham, telling reporters it is history and those who object are condoning "censorship." Quebec sovereigntists have promised to protest outside the [Plains of Abraham re-enactment], which they see as an insulting reminder of the defeat of their French ancestors in 1759. "What I find disgraceful is how the Bloc and their sovereigntist allies want to politicize this. It's cheap," said Liberal MP Pablo Rodriguez. "It's not a celebration. It's just a re-enactment. This kind of thing has happened often, all over the world. "It's a historical event, it interests some people and others, no." But the Bloc Quebecois continued demanding that the re-enactment be cancelled. It's back to school time across Canada so, for those of you lucky enough to have tuned out politics this summer, here's a quick recap of what's been happening on the federal scene. Conservatives: Spent the summer making it perfectly clear that the Conservative Party is in no way funding any sort of gay festivals, parades, or events in Canada (not that there's anything wrong with that!). After that, Harper pocketed the body of Christ, was 30 seconds late for a photo op, and misspelled Iqaluit. Sure, none of these scandals seem like big deals, but I'd say there's a 50/50 chance Paul Martin would have called a judicial inquiry into at least one of them, had they happened to him. While none of those touched him, Harper did get some well deserved flack over his latest string of Senate appointments - even Sports Illustrated took a shot at him. However, Conservatives were quick to reassure everyone that abandoning their principles and flip-flopping on their promises is fine because...wait for it...the Liberals did it too! Liberals: Rocco Rossi canoed. Michael Ignatieff spent some time thinking thoughts, and the thoughts he thunk made him think that it was time to end the probationary life support he had put the Conservatives on. 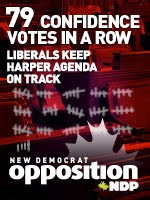 NDP: Spent the summer trashing the Liberals for rolling over on 79 non-confidence votes, and bragging about how only the NDP are able to hold the Conservatives to account. Then when the Liberals said they wouldn't roll over, there was, shockingly, a lot of talk about "making parliament work", "results for people" and that sort of stuff. 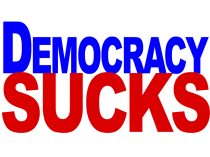 They also flirted with the idea of changing their name to the "Democrats", but decided to just steal the Democrats slogan instead. Bloc Quebecois: There was a rumour going around that Gilles Duceppe was on the verge of retiring. Turned out not to be true. Despite dozens of rumours, predictions of impending doom (remember when Paul Martin was going to wipe out the bloc? ), and brief flirtations with leaving Ottawa, I think we can all conclude that Gilles Duceppe is the Brett Favre of Canadian politics - he will never retire. Green Party: Having already lost in two provinces, Elizabeth May has decided to try her luck in Saanich, BC next election. This is part of a new and controversial strategy the Greens have adopted, whereby they will try to actually win seats. Also, "for the first time ever, the Greens have a written campaign plan which is fully detailed" - this might partially explain why the Greens haven't been able to win seats before. Refreshingly positive and a good, subtle counter to Just Visiting. There's been a lot of debate over whether or not Canadians want an election this fall. So, rather than give my take, I'll let Misters Harper and Ignatieff do the talking. "We need an election like a hole in the head. 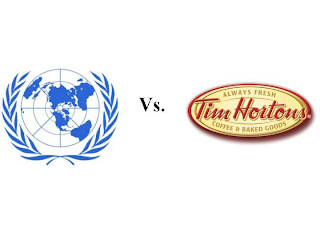 It is not the preferred choice of Canadians. We're in a recession (and) Canadians all know that an election is expensive." "In the past few months, and particularly over the summer, we have seen increasing signs that this Parliament is really not working very well anymore, it's becoming increasingly dysfunctional. Two of the three opposition parties don't support the government and say [it] should be defeated. [The other] says he doesn’t support the government but won't say, you know, whether he will defeat [it] or not. I don’t think that’s a tenable situation." A key source said Layton will announce that he’s willing to support the government on a case-by-case basis if it backs NDP private members bills on issues such as extending EI benefits, measures to help seniors, and regulating credit card rates. Harper, who met recently with NDP leader Jack Layton, said he is open to listening to any ideas the small opposition party might have to offer on the economy. Michael Ignatieff, yesterday: Stephen Harper has been prime minister for four years, and he’s never visited China. We’ll be there next week. Canadian Press, today: Liberal Leader Michael Ignatieff is cancelling a week-long trip to China due to his self-declared threat of a fall federal election, The Canadian Press has learned. I'm not going to knock Ignatieff at all over this. I mean, when I found out yesterday that the Liberals were going to force an election, that threw a wrench into my October travel plans. I'm sure the announcement caught Ignatieff off guard too. ITQ has the calendar figured out. The Tory accountability report must be tabled the week of September 28th, with a Liberal opposition day to follow 2 sitting days later (Sept 30 to Oct 6). This parliament could also meet its maker if the Tories introduce a ways and means motion around that time - which would probably be the way they'd like to go down, since Harper could then go around yapping about how the opposition parties voted against the home renovation tax credit (only, he'll probably phrase it as "the Liberal-socialist-separatist coalition killed the home reno tax credit"). Now, the Conservatives could bring in the ways and means motion 2 weeks earlier but that would nix Obama-Harper photo ops, so I can't see that happening. So, if you're planning a "non-confidence party", I'd start booking bars for late September or early October. With a 36 day campaign minimum, that sets us up for a November 9th or November 16th election. Given this is really a human tragedy, more so than a political story, there's not much I can really say here. Except that, obviously enough, I was wrong. In June, we set out four tests for Stephen Harper. Mr. Harper, you have failed all four. You’ve failed to protect the most vulnerable. You’ve failed to create jobs. Failed to defend our health care. Failed to restore our public finances. Mr. Harper, your time is up. Vous avez raté votre chance. SUDBURY — Michael Ignatieff says the Harper government is on "life support" - and he sounds like he may be ready to pull the plug. The Liberal leader kicked off a summer caucus retreat Monday on a hawkish note, suggesting he's keener to force a fall election than some of his strategists. "We've kept this government on life support for 10 months," Ignatieff said, noting that Liberals supported last January's recession budget despite deep reservations. "But in June I made it clear that in a whole number of areas, the government's performance was letting Canada down and it hasn't got better over the summer." "I am the lone vote on Stephen Harper's death panel"
"I am the Simon Cowell of Canadian politics, and I am not impressed"
"This government has been governing impaired - in October, I will be the breathalyzer Stephen Harper blows"
"The Harper Conservatives are like a piece of corn on the cob stuck in your teeth...in this metaphor, I am the floss"
"This government has grown more stale than the communion wafer that has sat in Stephen Harper's pocket for the past month"